In 2016, Rasmus launched a new charity initiative, "Hitters for Heroes," in which he pledged to donate $1,000 for every home run he hit to Team Rubicon, a disaster response nonprofit that utilizes the skills of military veterans to provide relief following natural disasters…Younger brother Cory, is a right-handed pitcher the Tampa Bay Rays organization…Colby and Cory have two younger brothers, Case and Cyle, with each of the four brothers about a year apart in age…When the four were teammates at Russell County (AL) High School in 2005, the school won its first state title with their father, Tony, coaching… Rasmus broke Bo Jackson's single-season state record with 24 home runs that spring…Father, Tony, was a 10th-round pick of Anaheim in the 1986 First-Year Player Draft…Rasmus grew up and still resides in Phenix City, Ala., where he was a member of the 1999 Little League World Series U.S. Championship Team, which lost to Hirakata Little League of Osaka, Japan, in the championship game. Signed with the Rays as a free agent on 1/30 ... Began the season on the disabled list from 4/1-5/2, recovering from hip surgery ... Placed on the 10-day disabled list on 6/23 with left hip tendinitis ... Appeared in 37 games for the Rays, batting .281 (34-for-129) with seven doubles, nine home runs, 23 RBI, and 17 runs scored ... Hit .333 (14-for-42) in 13 games during the month of June before going on the DL ... Placed on the restricted list on 7/13 and missed the remainder of the season. Returned to the Astros for a second season and appeared in 107 games with 95 starts at all three outfield positions (75-LF, 14-CF, 6-RF)… had 13 assists, tied for 3rd among AL outfielders behind CWS Adam Eaton (18) and BOS Mookie Betts (14)…they were the most by an Astros OF since Hunter Pence (16) in 2009...According to FanGraphs, ranked 4th among major league outfielders with 20 Defensive Runs Saved, behind Betts (32), TB Kevin Kiermaier (25) and TOR Kevin Pillar (21)...Marked his fifth consecutive season with at least 15 HR, joining LAA Mike Trout, BAL Adam Jones and TOR José Bautista as the only AL outfielders with a current streak that long..Was the first Astros player with 7 HR through the team's first 19 games since Morgan Ensberg (9) and Lance Berkman (7) in 2006...Hit .357 (15-for-42) with 17 RBI with RISP and 2 outs, 10th in the AL, compared to .187 (61-for- 327) otherwise...Was on the 15-day DL from Aug 5-30 with a cyst in his right ear…homered in his first plate appearance back from the DL…played in his last game on Sep 18, missing the final 14 games...Named AL Player of the Week for April 18-24, his second career weekly honor…led the AL with 4 HR and 10 RBI over that span…had a multi-HR game on April 21 at TEX, his fifth career grand slam on April 23 vs. BOS (off Clay Buchholz) and a game-tying, 2-out, 2-run homer in the 9th inning on April 24 vs. BOS...Hit safely in both games of the Astros series in St. Louis, June 14-15…they were his first games at Busch Stadium since 2011, when he was traded by the Cardinals to the Blue Jays prior to the trade deadline that season...Made his eighth Opening Day roster and seventh start. In his ﬁrst season with Houston, set a single-season career high in home runs...reached the 20-homer plateau for the fourth time in his career, and the third time in the last four seasons (also 2012-13)...marked the most homers by an Astros outﬁelder since Hunter Pence hit 25 in 2010...became the sixth AL outﬁelder since 2012 to record three seasons with 20+ homers, joining Mike Trout (4), Adam Jones (4), Jose Bautista (4), Nelson Cruz (3) and Yoenis Cespedes (3)...ﬁnished seventh among AL outﬁelders in homers...played in 137 games, his most since the 2012 season with Toronto...played 72 games in left ﬁeld (47 starts), 43 games in right ﬁeld (37 starts) and 43 in center ﬁeld (31 starts)...prior to 2015, had only started four career games in left ﬁeld and six career games in right ﬁeld, all coming with St. Louis in 2009...a career .213 hitter against left-handers entering the season, batted .252 (30x119) with ﬁve doubles, seven homers, 16 RBI and an .835 OPS (.364 OBP/.471 SLG) against southpaws...hit eight homers while posting a .374 OBP and a.548 SLG with runners in scoring position...made his seventh appearance on an Opening Day roster, and his sixth Opening Day start...placed on the Bereavement List on June 16...activated from the Bereavement List on June 19...missed six games in late June/early-July due to skin irritation...had a stretch from Aug.9-16 where each of his four hits were home runs...on Aug. 25 at NYY, recorded a double, triple, three runs and two RBI, becoming the ﬁrst Astro to reach those totals in a single game since Brad Ausmus on Aug. 26, 2003 vs. LAD...recorded his second multi-homer game of the season on Sept. 20 vs. OAK...posted his third multi-HR game on Oct. 3 at ARI, tying him with Luis Valbuena for the club lead in multi-homer games...from Sept. 1 through the end of the regular season, hit .289 (24x83) with three doubles, eight homers, 15 RBI and a 1.000 OPS (.385 OBP/.615 SLG)...was tied for the Major League lead in homers from Sept. 20 through the end of the season (6HR) with Manny Machado...started every postseason game for Houston in left ﬁeld, batting .412 (7x17) with a club-high four homers and six RBI...recorded a hit in each of his ﬁrst ﬁve postseason games with Houston...tied him with Chris Burke (2005) for the longest postseason hitting streak to begin a career with the Astros...his four homers tied him for the second-most hit by an Astros player in a single postseason with Lance Berkman (2004), trailing only Carlos Beltran (8 HR in 2004)...homered in each of Houston's ﬁrst three playoﬀ games, becoming the ﬁrst Astros player with a homer in three straight postseason games since Mike Lamb from 2004-05...set an MLB record by starting his career with an extra-base hit in each of his ﬁrst six career postseason games...tied a club record for walks in a postseason game when he drew three in Game 3 of the ALDS...had been accomplished nine times prior to Rasmus, most recently by Chris Carter in the 2015 AL Wild Card Game at NYY. Played his final season with the Blue Jays and appeared in 104 games, making 80 starts in center field...40 of his 78 hits went for extra bases (21 doubles, one triple, 18 home runs)...went 4x12 in pinch-hit situations with three home runs, the first three pinch-hit homers of his career...became just the second Blue Jays player to record three pinch-hit homers in a single season (also, Willie Greene in 1999)...was fourth among AL center fielders with 13 home runs, eighth with 20 doubles and fourth with a .420 SLG...posted a .996 fielding percentage in 238 total chances, committing just one error, with three outfield assists...had success in Interleague games, hitting .358/.414/.849 (58PA) with five doubles and seven home runs in 15 games...had one trip to the Disabled List, from May 13-June 18, with right hamstring tightness...played in six rehab games with Triple A Buffalo before returning to the Jays...hit his fourth career grand slam on May 4 at PIT. Among AL-CF finished 2nd with a .844 OPS, .505 SLG, T-2nd with 22 HR, 3rd with 66 RBI, 4th with a .339 OBP and 5th with a .278 AVG. Received the Honda Player of the Month Award for July by the Toronto Chapter of the BBWAA after hitting .371 with 12 doubles, three home runs, 17 RBI and 14 runs scored in 26 games that month. Homered in back-to-back games seven times this season, including two streaks of 3+ consecutive games with a home run, one of which was a four game streak (September 13-18, four total)…That four game home run streak was the 1st such streak of his career and began on the day in which he returned from the DL (left-oblique injury). His season ended prematurely after being struck in the face by a ball during mid-inning warm ups September 20 at BOS… Missed a total of 38 games this season due to two separate stints on the DL (August 14-September 13, left oblique strain and September 21-end of season, bruised left eye). From June 29 until the end of his season, a total of 46 contests, posted a .335 average with 14 doubles, eight home runs, 29 RBI and a .953 OPS. Hit six home runs off of left-handed pitchers, the most of his career … Posted a .256 average vs. southpaws compared to a .182 average in 2012, an increase of .074 percentage points. The 118 games he played in was the fewest amount of his career. In his first full season in Toronto played in a career high 151 games... Started 138 game in CF and three at DH...Tied his career high with 23 home runs and set a new mark for RBI with 75...Among AL centrefielders ranked 5th in RBI (72), HR (22) and 6th in BB (46)...Posted a .259 average with 17 home runs and 53 RBI prior to the All-Star break... Following the break hit .176 with six home runs and 22 RBI... In his career now has a .266 average and a .818 OPS in the first half of the season and a .209/.615 total in the second half...Batted .238 vs. right-handed pitching and .182 vs. left-handed pitching... Was productive with men in scoring position, posting a .276 average with seven home runs and 52 RBI... Enjoyed his best month in June, recording eight home runs and 25 RBI and a .291 average... Were the most home runs in a month since hitting nine in June of 2010...In his career has now hit 23 home runs in June with a .281 average and a .853 OPS... Has not hit more than 12 home runs in any other month...On June 5 at CWS collected five hits, representing a career high, coming within a triple of the cycle...Aug. 1-7 posted multiple hits in four consecutive games... June 23 at Miami hit his 3rd career grand slam in the 9th inning of a 7-1 victory... Had two multi-home run games and now has four career... June 19 at MIL hit a game-tying 9th inning home run off John Axford in a 10-9 victory...Posted a career high seven outfield assists. Acquired on July 27 from St. Louis Cardinals along with LHP Brian Tallet, LHP P.J. Walters and LHP Trever Miller in exchange for RHP Edwin Jackson (acquired from CWS), RHP Octavio Dotel, LHP Marc Rzepczynski and OF Corey Patterson... Appeared in 35 games for the Blue Jays and 94 for the Cardinals... Overall batted .225 with 24 doubles, six triples, 14 home runs and 53 RBI... WELCOME TO TORONTO: Made his debut on July 28 vs. BAL, going 0-5... Did not collect his first until his 4th game, going 0-13 to start his Blue Jays career... Collected hits in 9 of his next 10 games from July 31-Aug. 10... Aug. 6 hit his first home run as a Blue Jay off Chris Tillman of BAL... On Aug. 18 at OAK had three hits, including a double and home run... After that contest batted only .069, going 4-58 in his final 16 games... Started all 35 games with the Blue Jays in CF... ITS IN THE CARDS: Got off to a strong start batting .301 through the end of April, with five doubles, two triples and three home runs... Had 23 multi-hit efforts, including a four-hit contest May 27 at COL... The four hits were a career high (3rd time) and also collected a career two triples in the same contest... All appearances as a defender were in CF... GRAND DAY: With the bases loaded, collected four hits in nine at-bats with a double and grand slam... The grand slam came on June 7 vs. SF and was the 2nd of his career... LEAD HIM OFF: When leading off an inning, posted a .300 average (30-100) with six doubles and five home runs with an 868 OPS... Is now a career .277 hitter with an .857 OPS when leading off an inning in his career. Set a career high in almost every offensive category in his second full season in the Majors...Hit first career grand slam on his 24th birthday (8/11 at CIN) becoming the fifth player (3rd Cardinal) in MLB history to hit his first grand slam on his birthday...Hit a 483-foot home run at KC (6/27), the longest by any N.L. player in 2010...Recorded his second career multi-HR game 9/9 at ATL tying his career high in hits (4) and RBI (4)...His 12 stolen bases ranked 2nd on the team (Pujols, 14) and his 23 home runs ranked 3rd on the Cardinals...Walked 63 times, ranking 3rd on the team, after drawing 36 walks his rookie year...Named National League Player of the Week (5/31-6/6), batting .500 w/3 HR & 9 RBI...Tied for the team lead with three triples...Sat out 13 games with a strained right calf (8/15-8/30)...Walked a career high four times 8/13 vs. CHI and scored a career high four runs on 9/17 vs. SD...Hit nine home runs in the month of June, tying for second best in the NL...Ranked 9th in the NL with a .306 road batting average...Batted .323 in September, setting a monthly high with 32 hits (T5th in NL)...Was 6-for-13 (.462) as a pinch-hitter with a home run and 4 RBI. His pinch-hit homer on 6/22 at TOR was first of his career...Had a solid .321 BA (10-31) in 0-2 counts, ranking 2nd in N.L. (4th, MLB)...Led Cardinals outfielders with seven fielding gems...His .358 BA off balls in play in 2010 was 7th-best single-season mark for a Cardinal since 1985 and best since Jim Edmonds' .382 BABIP in 2002. Completed first season in the Majors by finishing among rookie leaders in most offensive categories...Led all rookies in games played (147), finished 2nd in homers (16), 4th in RBI (52), runs (72), hits (119), doubles (22) and multi-hit games (32) and his 40 extra-base hits ranked 5th...Had a team-high 104 starts in CF. Led the team with five bunt singles...Was just the sixth Cardinals rookie since 1954 to start 100 or more games in CF, joining Ray Lankford ('91), Bake McBride ('74), Curt Flood ('58), Bill Virdon ('55) and Wally Moon ('54). The last rookie to serve as primary CF for the Cardinals during a playoff season was Willie McGee in 1982...Was the youngest Opening Day player (22 yrs) for the Cardinals since Albert Pujols (21 yrs) in 2001...Hit a pair of walk-off HR's. Had key 2-out game-tying single in 9th vs. LAD on 7/29 to send game to extra innings (15 inn. win). The Cards top prospect began his season at Triple-A Memphis, but suffered through an injury-plagued season...Got off to a slow start, hitting just .210 in April and .218 in May before getting hot in June, producing a .337 month with four homers and 15 RBI...Played in just one July game before he was placed on the DL on 7/8 with a strained right groin. Briefly came off the DL on7/18 but was returned back to the DL 7/23 with a sprained right knee...Played in three games with the GCL Cardinals while on a rehab assignment from 8/23-28...Was reinstated from the disabled list on 8/28 and played in three games for the Palm Beach Cardinals (A)...Was selected to both Futures Game and Team USA Olympic rosters, but did not play due to injury...Named by Baseball America as the top prospect in Cardinals system and among all Triple-A players in the PCL. The Cardinals top prospect spent the entire season at Double-A Springfield and was named the Cardinals Minor League Player of the Year for a second-straight season. Becomes just the second Cardinal farmhand to win back-to-back Minor League Player of the Year awards since the award'sinception in 1995 (John Gall, 2002-03). Was named to the First Team Minor League All-Star team as an outfielder and to the Double-A All Star team by BaseballAmerica and was also named to Topps' Double-A All-Star team. His 29 homers and 93 runs scored led the Texas League, as did his .551 slugging pct. Collected 37 doubles, good enough for3rd among all Texas Leaguers while his 69 extra-base hits ranked first. Selected to play in the Texas League All-Star Game where he was the starting centerfielder. He singled, walked and scored arun in that game. Was also named to the Texas League Post-Season All-Star Team. Joined teammate C Bryan Anderson at the Futures Game during Major League All-Star break in San Francisco. Was 0-2 offthe bench, playing in centerfield. Selected to the Team USA roster that won the gold medal in the 2007 Baseball Federation World Cup in Chinese Taipei. Was oneof three players named as the tournament's Best Three Outfielders. During the World Cup games, Rasmus led the USA team with 13 hits, batting .382 (13-34) overall. He played in all 10 games,also a team high, and also played the most innings of any team member (78.0). Named to the TOPPS /Minor League Baseball Double-A All-Star Team. Named the Texas League Payer of the Month for May (.340, 8HR, 24RBI) and August (.365, 12 HR, 17RBI). Was a three-time Player of the Week for the Texas League, including back-to-back weeks in August (8/13-19 & 8/20-26). Twenty four of his 29 homers came vs. righties, batting .287 with 50 RBI against RHPs. Hit in 18 of 19 games from 4/29-5/17 (27-68, .397) including a 12-game hitting streak from 5/6-17 (16-41, .390). Was named Texas League Player of the Week from 5/28-6/3 when he hit .450 (9-20) with four doubles, three homers and 10RBI. The three homers and nine of those RBI came in two games 5/28-29 vs. San Antonio. Ended the season by hitting in 16 of his final 18 games. Had a 14-game hitting streak from 8/15-29 with a .459 average and28 hits in 61 at bats. Baseball America named Colby as the Best Defensive Outfielder in the Texas League, the Most Exciting Player andpossessing the Best Outfield arm in the League. The Cardinals top prospect climbed to High-A ball in his second professional season en route to being named Cardinals Minor League Player of the Year...Combined to bat .288 with 16 HRs in 131 games split between Quad Cities (A) and Palm Beach (A)...Led all Cardinals farmhands with 85 RBI. His 28 stolen bases ranked third among STL minor leaguers...Selected to play in the Midwest League All-Star Game held in Quad Cities on 6/20...He doubled with a pair of hits in the start in RF and was the only player on the West side to have two hits...Began the season at Quad Cities and appeared in 78 games. Started in center field 74 times and was the DH in four games...Was 2-for-30 (.067) in his first seven games but then batted .397 (29-for-73) over his next 16, including an 11-game hittingstreak from 4/19-5/1 that featured nine multi-hit efforts...Posted a .330 (33-for-100) batting average in May, earning Cardinals Minor League Player of the Month honors...Batted .355 (44-for-124) with runners on base at Quad Cities...Fashioned a 12-game hitting streak from 6/6-17 (.364, 16-for-44)...Was promoted to Palm Beach on 7/3. Had one hit in his first 17 at-bats at Palm Beach before stringing an eight-game hitting streak from 7/9-16 (.300, 9-for-30)...Had a stretch of four consecutive multi-hit games from 8/10-14 (.588, 10-for-17), including a four-hit game on 8/11 vs. Jupiter...In his final 26 games, batted .300 (27-for-90) with two HR and 19 RBI. Appeared in 62 games at Johnson City (R)...his.514 slugging percentage ranked 2nd-best among theCardinals 2005 draft class...47 runs scored ranked 4thmost in the Appalachian League...collected five triples, tied for 3rd in both the Appy League and STL minor leaguesystem. October 29, 2018 RF Colby Rasmus elected free agency. October 29, 2018 Baltimore Orioles activated RF Colby Rasmus from the restricted list. July 3, 2018 Baltimore Orioles placed RF Colby Rasmus on the restricted list. June 21, 2018 Baltimore Orioles activated RF Colby Rasmus from the 60-day disabled list. 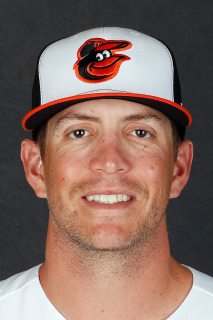 June 19, 2018 Baltimore Orioles sent RF Colby Rasmus on a rehab assignment to Bowie Baysox. June 11, 2018 Baltimore Orioles transferred RF Colby Rasmus from the 10-day disabled list to the 60-day disabled list. Left hip flexor strain. June 5, 2018 Baltimore Orioles sent OF Colby Rasmus on a rehab assignment to Frederick Keys. June 1, 2018 Baltimore Orioles sent RF Colby Rasmus on a rehab assignment to Bowie Baysox. April 7, 2018 Baltimore Orioles placed RF Colby Rasmus on the 10-day disabled list. Left hip flexor strain. March 29, 2018 Baltimore Orioles selected the contract of LF Colby Rasmus from Norfolk Tides. February 21, 2018 Baltimore Orioles signed free agent LF Colby Rasmus to a minor league contract and invited him to spring training. February 21, 2018 LF Colby Rasmus assigned to Norfolk Tides. November 2, 2017 LF Colby Rasmus elected free agency. July 13, 2017 Tampa Bay Rays placed LF Colby Rasmus on the restricted list. June 23, 2017 Tampa Bay Rays placed LF Colby Rasmus on the 10-day disabled list retroactive to June 19, 2017. Left hip tendinitis. May 2, 2017 Tampa Bay Rays activated LF Colby Rasmus. April 22, 2017 Tampa Bay Rays sent OF Colby Rasmus on a rehab assignment to Montgomery Biscuits. April 6, 2017 Tampa Bay Rays sent CF Colby Rasmus on a rehab assignment to Charlotte Stone Crabs. April 1, 2017 Tampa Bay Rays placed LF Colby Rasmus on the 10-day disabled list. Recovering from hip surgery. January 30, 2017 Tampa Bay Rays signed free agent LF Colby Rasmus. November 3, 2016 LF Colby Rasmus elected free agency. August 30, 2016 Houston Astros activated LF Colby Rasmus from the 15-day disabled list. August 7, 2016 Houston Astros placed LF Colby Rasmus on the 15-day disabled list retroactive to August 5, 2016. Cyst in right ear. November 13, 2015 Houston Astros activated LF Colby Rasmus. November 2, 2015 LF Colby Rasmus elected free agency. June 19, 2015 Houston Astros activated LF Colby Rasmus from the bereavement list. June 16, 2015 Houston Astros placed LF Colby Rasmus on the bereavement list. January 20, 2015 Houston Astros signed free agent LF Colby Rasmus. October 30, 2014 CF Colby Rasmus elected free agency. June 18, 2014 Toronto Blue Jays activated CF Colby Rasmus from the 15-day disabled list. June 12, 2014 Toronto Blue Jays sent CF Colby Rasmus on a rehab assignment to Buffalo Bisons. May 15, 2014 Toronto Blue Jays placed CF Colby Rasmus on the 15-day disabled list retroactive to May 13, 2014. Right hamstring tightness. October 1, 2013 Toronto Blue Jays activated CF Colby Rasmus from the 15-day disabled list. September 21, 2013 Toronto Blue Jays placed CF Colby Rasmus on the 15-day disabled list. Left eye contusion. September 13, 2013 Toronto Blue Jays activated CF Colby Rasmus from the 15-day disabled list. August 14, 2013 Toronto Blue Jays placed CF Colby Rasmus on the 15-day disabled list retroactive to August 12, 2013. Left oblique strain. September 16, 2011 Toronto Blue Jays activated CF Colby Rasmus from the 15-day disabled list. September 10, 2011 sent OF Colby Rasmus on a rehab assignment to New Hampshire Fisher Cats. August 27, 2011 Toronto Blue Jays placed CF Colby Rasmus on the 15-day disabled list retroactive to August 24, 2011. Jammed wright wrist. July 28, 2011 Toronto Blue Jays activated CF Colby Rasmus. July 27, 2011 St. Louis Cardinals traded CF Colby Rasmus, LHP Trever Miller, LHP Brian Tallet and RHP P.J. Walters to Toronto Blue Jays for RHP Edwin Jackson, Octavio Dotel, Marc Rzepczynski and Corey Patterson.